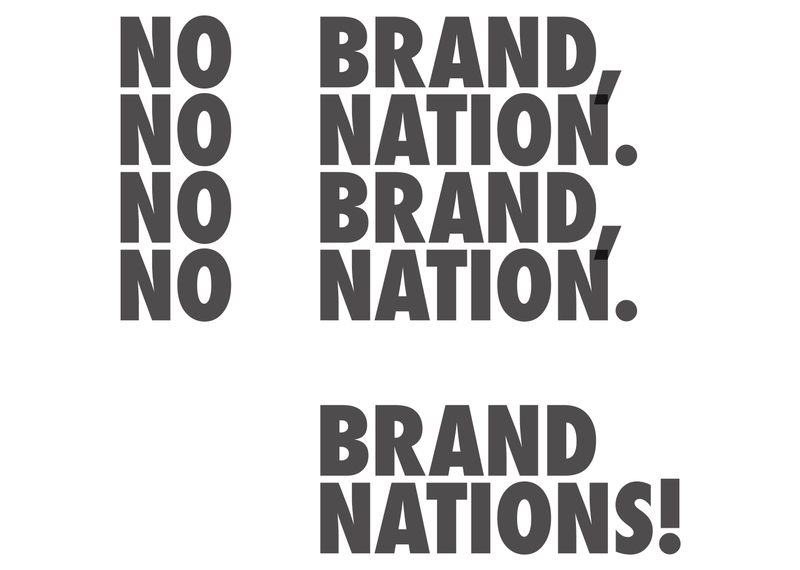 Branding Islands Making Nations is a case study competition intended to open the discourse on added value in design, expanding upon the 15th International Architecture Exhibition’s call to arms by inviting an extended field of spatial practitioners to the Biennale Architettura di Venezia. Consultants and communication designers, marketing and advertising experts shall speculate on the role of branding in the making of a place. The conceptual framework is based on the understanding that the politics of representation determine the success of an intervention in the built environment. Departing from an ethical critique through satire, a competition format foreign to architectural design is employed to value and review works under the framework of a sales pitch. In the case of a government seeking to determine the feasibility of a territorial claim, entrants are tasked with the presentation of a branding package surrounding an artificial landmass instrumental in legitimizing a nation’s territorial claims. Select teams will represent the mix of stakeholders and issues at play in the political economy of global geopolitics and geoeconomics in the South China Sea. Their goal will be to construct land that will transition to a sovereign state in the eyes of the public as political and economic contexts change. Thus, the creative scope of entries will not be evaluated upon their moral stance. Rather, entries will be analyzed in their rich interrogation the role representation plays in its ability to distort, mislead, disguise, or reverse meaning. By creating incongruity between reality and what is represented or not, successful entrants will be able to make the negative appear positive in legitimizing a nation’s territorial claim. Conscious of the possibility to manipulate representation as means of subversion, the project shall create a discourse on the status spatial practitioners hold within societal decision-making structures between accountability and profitability. Expanding possibilities rather than shifting responsibilities, it is based on the firm belief in the necessity to expose the glitches, loopholes, and gray areas in systems as first step toward conflict resolution. The Biennale Architettura di Venezia is the world’s most prestigious showcase for new design projects by emerging talent, attracting over 350,000 visitors every two years. Pritzker Architecture Prize laureate of the same year, the 2016 edition is curated by the Chilean architect and founder of Studio Elemental, Alejandro Aravena. In order to improve the quality of the built environment and consequently people’s quality of life, the Biennale Architettura di Venezia 2016 is interested in how architecture can introduce a broader notion of gain – design as added value.